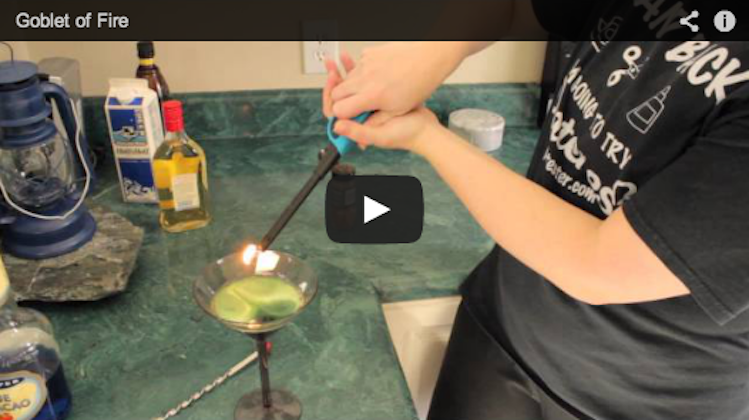 The Pintester makes a cocktail and lights it on fire-- no kidding. It's actually what the recipe said to do. If I remember correctly from my bar days, turn the spoon over, put the spoon close to the liquid & pour the liquid down the spoon & it will float. It’s how to make a black & tan. And I have to share that when I was 21, my friend couldn’t come out with us, but made me a drink at the bar we worked at. He said it was the “Flaming Blue Lamborghini” It was blue, in a martini glass & on fire. And I drank it as quickly as possible, on fire, through a plastic straw. Yes it burns going down! Couldn’t even tell you how it tasted. I love that you always look totally terrified when you’re shaking your booze. Also, LONG LIVE HARRY POTTER!!!!! WOOT! Or running the liquid down a knife blade (butter knife please!) works as well as a bar spoon. Yeah, now I definitely want to try using a giant butcher knife to float my cream. When I read Goblet of Fire, I was sort of expecting a repeat of when you tried to cut your beer bottle with fire. I’m glad this turned out better than that. there is LITERALLY nothing happening besides the shaking of the bottle. No one is saying a word. Also gotta love that it thinks you made the cobbler of fire. ERMAGHERD! I think I peed my pants watching you do this! YOU ROCK! Am I the only one who feared for your insurance policy premiums after the third clap?